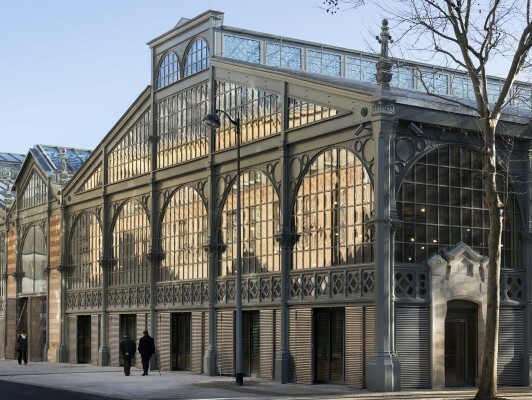 Situated in the third district of Paris, the « Carreau du Temple » has been restored and rehabilitated by the city of Paris. Built in 1830, the main part of the building is a 60 m x 65 m market hall presently used as a multi-use space, divided in three naves with a zinked rood supported by so-called Polonceau beams in cast iron. This complex is a rare example of the industrial architecture of that era. The project consists of creating two underground levels as well as a scene and three office levels. The underground levels house the sport installations, studios and technical spaces. The main naves was reorganized and is used as multi-funktion spaces. The zinked roof was reconfigurated in order to fullfill the technical and acoustical norms (RT2005).This fundamental change in loading was integrated in a reinforcement concept of the structure, which aimed to have a minimal impact on the existing architecture. The focus was also brought on compatibility issues between cast iron and steel as well as the rehabilitation of cracked columns.